388 pages | 156 B/W Illus. Targeted Molecular Imaging covers the development of novel diagnostic approaches that use an imaging probe and agent to noninvasively visualize cellular processes in normal and disease states. It discusses the concept, development, preclinical studies, and, in many cases, translation to the clinic of targeted imaging agents. 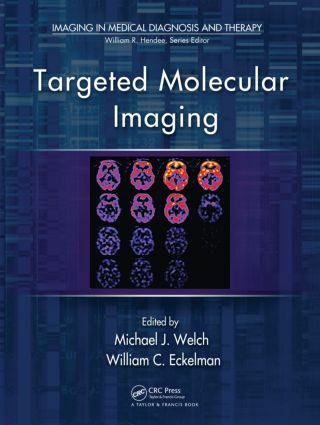 The many case studies that form the core of this book deal with the development and translation of non-nuclear probes and radiotracers; other sections address critical topics such as In vitro studies, small animal research, and the application of targeted probes for nuclear, optical and MRI imaging. The chapters use a common format to demonstrate how various investigators approach the comprehensive task of validating a new targeted probe. Using these case studies, investigators can generalize and apply the information to their own specific targeted probe. The insights provided by the contributors, experts who have developed these approaches in their own groups, help guide scientists planning to translate imaging agents from the concept stage to clinical application. "… a timely resource for a rapidly advancing field, giving a comprehensive account of the state of the art in disease modelling, imaging studies in animals, imaging in initial human studies, and the application of molecular imaging in pharmacy and drug discovery. … a helpful tool for all readers involved with targeted molecular imaging, medical chemistry, pharmacology, radiology, and medical physics. It would also be a valuable text for graduate students, postdoctoral fellows, and junior faculty members who are becoming involved in this rapidly expanding field … edited by two masters in the field." "… this book is a must for new investigators in the field. Even seasoned investigators are strongly encouraged to consult sections of the book often in order to insure their own studies are complete. Especially important is the interdisciplinary approach utilized in the case studies. This book could also be a valuable resource in graduate classes or as a basis for a continuing education class. The book was written with foresight, such that it can be considered a timeless addition to anyone’s collection. Many, many costly pitfalls can be avoided through thoughtful review of the information contained within this reference." "This text successfully fulfills its goal by introducing the concepts of molecular imaging agent development and then providing a diverse set of examples of targeted agents. … The strength of this book is its emphasis of case studies that are representative of the various types of translational studies that can be performed using molecular imaging." Dr. Michael J. Welch is Professor of Radiology, Professor of Chemistry, Professor of Developmental Biology and Professor of Biomedical Engineering at Washington University, St. Louis. He is a recipient of many honors; these include the Paul C. Aebersold Award, the Georg Charles de Hevesy NuclearPioneer Award and the Cassen Prize from the Society of Nuclear Medicine and the St. Louis Award, the Midwest Award and the National Award for Nuclear Chemistry from the American Chemical Society. He has served as President of the Society of Nuclear Medicine and in 1999 was elected to the Institute of Medicine of the National Academy of Sciences. Dr. Welch received a bachelor’s degree from Cambridge University, England and a Ph.D. in Radiochemistry from Queen Mary College, London. His primary research interests involve the development of novel PET agents, particularly targeting cancer and cardiac disease. Dr. William C. Eckelman is presently Professor of Radiology at UCSD and the president of Molecular Tracer LLC. A pioneer in Tc-99m radiopharmaceutical development, he and colleagues developed the Instant Tc-99m Kit, which became the basis for all subsequent 99mTc radiopharmaceutical kits, and targeted receptor-binding radiotracers for human use for both SPECT and PET, including the first neuroreceptor image in humans. Dr. Eckelman has been the editor-in-chief of Nuclear Medicine and Biology since 1985. He received numerous awards including the Paul C. Aebersold Award, the Institute of Clinical PET Distinguished Scientist Award, the American College of Nuclear Physicians Corporate Achievement Award, the Georg deHevesy Nuclear Pioneer Award, the Great Golden Seal of Padua University in recognition of contributions to Radiopharmaceutical Development and the Society of Radiopharmaceutical Sciences President’s Award.